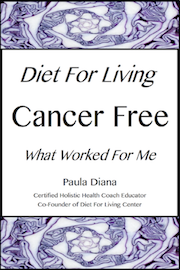 Since I was diagnosed with cancer at 53 years old, and committed to eating organic raw living foods, I have been practicing saying “no thank-you” gracefully, without feeling guilty. When I finished with my year of eating totally raw, and transitioned to eating 80% raw/living foods and 20% healthy cooked foods, I continued on my journey without looking back. The first year I was diagnosed with cancer was a self discovery time. It was all about learning to save my life. A lot of culinary hermit time. Like many people who are embracing radical diet change, we hope to avoid this step. It can’t be done. Taking a stand for what you need takes courage, but it also takes patience. Staying steady, allowing the change to take place deeply in yourself first. Patience: Something meaningful happened to me maybe six years in. My brother, a Standard American Diet eater with a family to match, picked me up at the airport and said with no prompting, “We can go to Whole Foods on the way home and pick-up your foods” and then paid for all of it. I am a great advocate of not teaching your family unless they ask, so I was touched to the core. My brother was saying, “I don’t know what you eat, but I support you because I love you”. This gracious giving from him filled my heart to bursting. Socially we say “yes” because we don’t want to let people down. 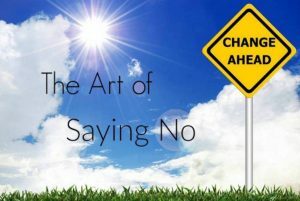 How to say “no” without saying “no” is especially hard for people pleasers. For some of us, the word “no” is literally the hardest word to come out of our mouths. For years standing up for myself made me feel a bit ill in the stomach and a bit out of balance. Yet no one gains when we don’t stand-up for ourselves. If we don’t claim our own health we suffer as we decline and so does everyone around us. It’s a no win for everyone. Once we commit to a new healthier lifestyle, we have to be very, very, very clear what are goals are. Because everywhere we turn, we will meet the ultimate challenge. A friend or family member who has invested their time in making a cake or pie, and will look broken if we don’t eat some. Office parties, where you may appear like a kill-joy because you are not indulging in a cup-cake sugar binge. Even family members who are less than understanding…..and waiting for us to come to our senses. But here’s the thing. I have found that others respect me when I’m not vague but stand up for myself, without trying to convince. My love of what I am doing will inspire those who are willing to seek change…..
All of us must live in the world with conviction and truth. We are the seed. When we build our own core foundation, our coaching businesses will get stronger…..
Set Your Dreams In Motion! A $300 deposit holds your place.